Impeccable Taste: Skinner April 26 Fine Wines & Rare Spirits Auction Anchored by Two Significant Collections | Skinner Inc.
She goes on to say that, like many of the collections that Skinner has presented in their ten years of fine wines auctions, “These wines have been acquired over a lifetime of passionate acquisition and tell the story of the consignor’s life and travels through labels, vintages, vineyards, and bottles.” The discerning, devoted connoisseurs who assembled these fine collections were true oenophiles whose personal tastes and histories are expressed in the wines they lovingly acquired. 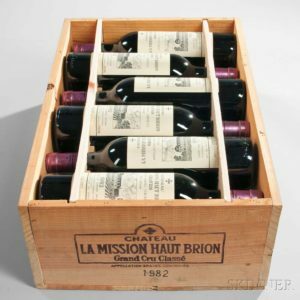 The Coastal Cellar’s meticulous ledger lists as the earliest acquisition a single bottle of Chateau Ausone 1964. Through the 1980s the owner’s love of wine was expressed in extensive purchases from retailers, auctioneers, and producers, and then maintained in custom-built cellars. The Essex Collection was assembled from the 1960s through the 1980s to celebrate professional milestones. Full unopened cases mingled side-by-side with single bottles, slumbering undisturbed in a New England cellar. An intriguing selection of French and American spirits completes this auction, including a generous selection of Buffalo Trace Antique Collection, Willett, Black Maple Hill, and Van Winkle. Included are numerous examples of Very Olde Saint Nick and Van Winkle special bottlings for the Japanese market. Among these choice spirits, one highlight is Lot 310, Old Rip Van Winkle 23 Years Old, with a crystal decanter and two glasses (750ml, $4,000-5,000). Marie Keep points to the unique nature of the market for fine wines and rare spirits. Wine, she notes, is an intimate purchase with distinctive characteristics: it is meant to be consumed, it is in dwindling supply from limited production, and therefore is consistently in high demand. Previews for this auction are by prior arrangement with the department. The telephone number is 508-970-3246, or e-mail finewines@skinnerinc.com.